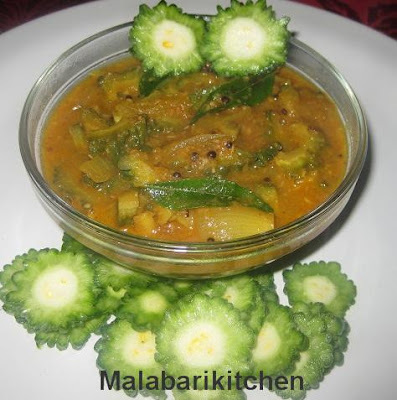 Bitter gourd is not usually a popular vegetable but certain preparations make it easy to go with. 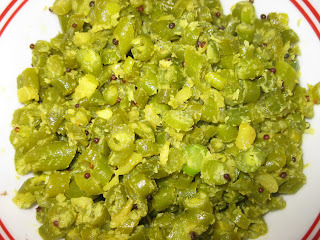 This is made with bitter gourd and fried coconut. Tamarind juice is added to this which gives a sour taste and that goes very well with the bitter taste of bitter gourd. This recipe was given to me by my friend Deepthi. This goes very well with rice. =►Soak tamarind in ½ cup of water and make juice. 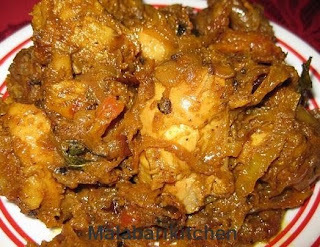 =►Heat ½ tsp oil in a pan, add grated coconut and shallots into it. =►Fry it till the coconut turns light brown color and grind it well. =►Heat 2tsp of oil in pan, put mustard seeds allow it to crack. =►When it cracks add ginger-garlic paste, curry leaves and sauté it well. =►Then add bitter gourd pieces and sauté it well. =►Add turmeric, chilly and coriander powder into it. =►Allow it to cook for 3-5 min on medium flame. =►Add tamarind juice and cook for 4-5min. =►Finely add grinded coconut paste into it and allow it to boil for 1-2min. =►Switch off the flame. It goes well with plain rice.